As the window draws to a close, the speculation dies down, a proportion of us slowly concentrate more on the football being played rather than fuss over who has bought who and what money has been spent. Today we examine and reflect on whether the January transfer window was a success for Manchester United. It’s universally agreed that United have needed a refreshening of their current squad and investment is paramount to the forward thinking approach Manchester United adopt. Even when Sir Alex Ferguson was in charge during his last couple of seasons it was there to see that the cracks were forming within the squad and positions were starting to look stretched. The squad was both ageing and needed a breath of new quality faces around the changing room to ensure the Reds could compete for the top trophies and medals. However, this task was not completed by Fergie. And as a result, it has left United in the state of turmoil. The question can be posed, how were Manchester United able to win the Barclays Premier League with the same squad that they have today, except Mata and Fellaini? I’m an avid follower of the ‘Fergie Effect’. The effect that Sir Alex Ferguson was able to instil into his average bunch of players to play out of their socks week in – week out. It just goes to show what a fantastic manager he was. Saying that, though, who do we blame? Was Fergie selfish for buying Robin Van Persie, someone who arguably United didn’t need and although one may say “a squad can never have too many top players”, it wasn’t exactly the positions United needed to invest in before he jumped the ship after winning his 20th title. Arguably, this has left David Moyes in a rather difficult situation as he has a rebuilding process to undertake. It may not be pretty, but nonetheless, it’s a job that needs doing now or face a decline rather similar to Liverpool in the 80’s which they still haven’t fully recovered from. So David Moyes, no pressure then. In perspective, this season we’ve seen United splash the cash on two big name signings. With the capture of Marouane Fellaini from Everton FC for a lump sum of £27.5m and more notably [dropcap] [/dropcap]playermaker Juan Mata from Chelsea FC for a whopping £37.1m, United are starting to wave the wallet on a squad that’s needed TLC for a number of seasons. A further question to ask oneself is whether the January’s transfer window could’ve been more successful for the Reds? Or on the contrary, has it been a relatively good one for United, baring in mind that January windows are notoriously known for being drab and boring? 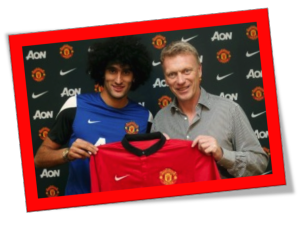 With the constant ‘playing down’ of any signings in January by David Moyes, United were surprisingly able to secure the biggest deal of the transfer window, smashing their transfer record in the process by signing Juan Mata from Chelsea FC. Had Moyes learnt from his mistakes in the summer when he was ever so public concerning the Fabregas bids and saga which rolled over for some months, arguably making United the laughing stocks of the summer window? The masterstroke Ed Woodward played in January to secure the signature of the former Chelsea star was impressive on a number of levels. He was able to negotiate through an intermediary with Chelsea in order to avoid any cross-talk of Rooney heading south to Stamford Bridge as part of any deal for Mata. It was reported on a number of occasions Chelsea had contacted Woodward in order to sit down regarding the Mata deal, but Woodward refused in order to avoid any awkward discussions they may have brought up with regard to Wayne Rooney being apart of such a deal. The news was first reported by Miguel Delaney on January 2nd and it finally broke that United had concrete interest in Mata later on in the window, the wheels started to turn at a million miles an hour. Reports were flying around from an array of sources across the media stating United were in for Mata and come the 24th January both clubs confirmed they had agreed the figure for the transfer of Mata to United and a medical would take place the following day. 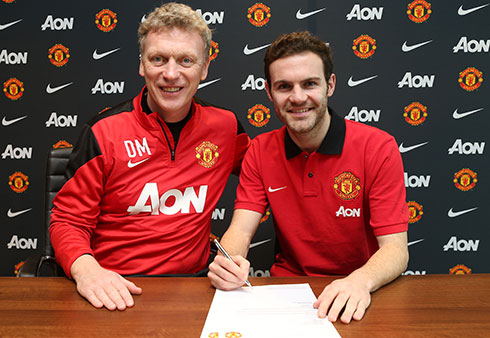 Was the signing of Mata the answer to United’s midfield issues? The obvious answer would be no, but one can state that United had to start investing somewhere. With the capture of Fellaini in the summer with the hope to solve their defensive midfield issues out, United were hoping the Mata coup this January would solve their much needed spark to ensure creative juices were flowing in the final third. Like any squad, United need time to adapt to the arrival of new players and may even need to alter their formation to compensate for the signing of a new number 10 primarily. With that being said, it’s evident the key is that time must be given to both Moyes and the signings to settle and then finally make their mark on the historic club. There has been all sorts of unrealistic rumours of potential targets this month appearing in the papers and being tweeted worldwide from various sources. Some of them are from the usual ‘false rumour talking’ suspects and some from trustworthy individuals as well. Who does one trust in the transfer window tombola? A piece of advice, if a person claims to be ITK or ‘in the know’, they most probably aren’t. In fact, they definitely aren’t. One must ask the question, if they are ‘in the know’, why would they be so kind to share their ever so private knowledge and information with the world? Laughably, these people are still given the time of day by many, which then gives them leverage to spout more rubbish and stir further false rumours about players moving to other clubs, most of which are complete nonsense. Often you’ll find that these ‘keyboard warriors’ are reporting other media outlets stories and rumours often claiming to pass it off as their own ‘in the know’ information. The prospect of someone buying into these nonsensical rumours is utterly depressing. So, I pose the question to you the reader, was the January window successful or not? I believe so, along with many others that agree that the rebuilding process of Manchester United Football Club will be a long and painful job, hopefully one which will fix itself sooner rather than later. Meanwhile, we must continue to back our team, manager and board to pull us through this difficult time to ensure we remain fighting for the top prizes in football.